One of the resources every family historian hopes to find and treasure is a family Bible full of handwritten notations of births, marriages, and deaths. These Bibles are often beautiful in themselves for their illuminated pages, or for the well-worn leather covers molded by devoted hands. Not to be overlooked, however, are the enclosures some owners pressed between those pages, enclosures which might yield some of the basic data always sought, and which might also give insight into the owners’ personalities and the events of their daily lives. While many researchers are thrilled to have one such Bible, I found myself with five, including my great-grandmother Felicia Lee’s fifteen pounder which she carried with her until her death in 1952 at age 97. 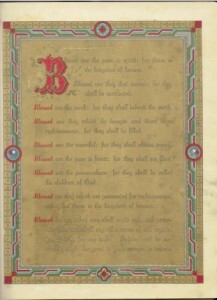 Her huge Bible with its illuminated front page also contained Certificates of Excellence for her second son, Robert Edward Lee; a corsage of dried flowers; and even a notation of her husband’s second marriage in 1918 (but no notation of their divorce). Felicia recorded every birth, marriage, and death in her Bible, and other family members continued the effort even after her death. 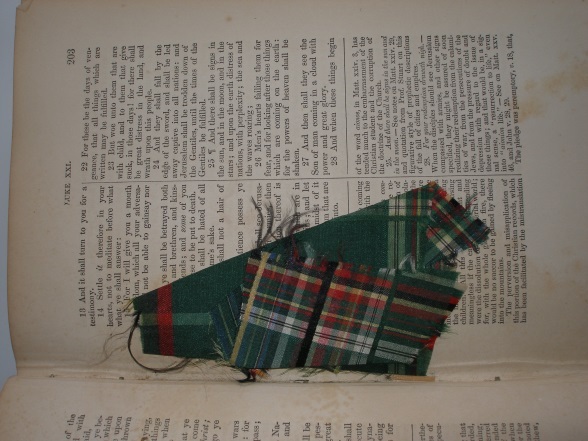 Great-great-grandmother Mary Ann Stone Cony (1840–1927) left her Bible so well-worn it is almost spine-less, filled with not only vital records but also newspaper clippings, notes from grandchildren (in childish pencil-scrawls), and even fabric scraps. The newspaper clippings report deaths of friends and family (e.g., the death in 1886 of my great-great-great-grandmother Experience Read Cony, who was delivered by midwife Martha Ballard in 1802), weddings, anniversaries, and “Recipes of New England Housewives.” The fabric scraps were still of strong colors and fascinated me because I realized Mary Ann was wearing a dress of that plaid in one of her tintypes. Married to Charles Otis Cony in 1861, this might have been her wedding dress. 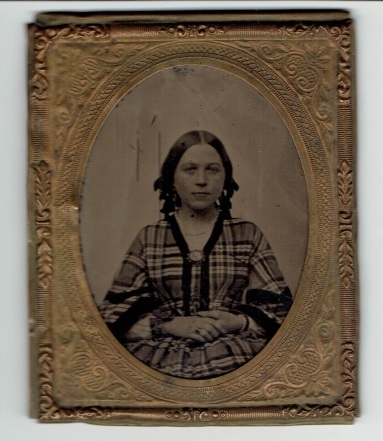 Great-great-grandmother Mary Helen Sawtelle Church gave her son Ambrose (1861–1896) a small Bible on March 18, 1880 (perhaps it was an Easter gift, which was on March 28th), inscribing Scriptures for his inspiration. 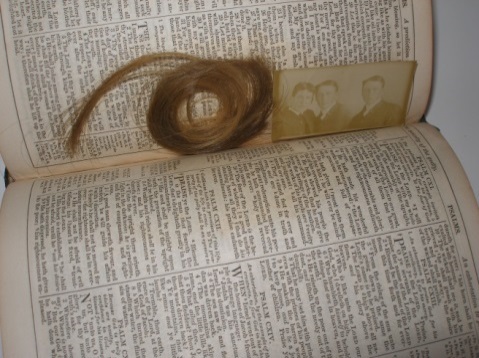 Only sixteen years later she would include his obituary in the same Bible, and pressed between its pages is a lock of his hair along with a tintype of Ambrose with his brother George (1859–1890) and Ambrose’s son Rex. 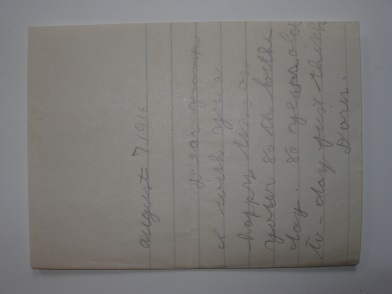 Ambrose’s wife Ellen Frances Cony Church treasured the Bible, eventually passing it on to their son and grandson. This Ambrose Church’s great-grandfather’s Bible provided me with an almost complete outline of that line of the Church family on multiple pages from John (1709–1806) and Amy Winter Church (1711–1815) to my grandfather Rex Otis Church (1883–1956). 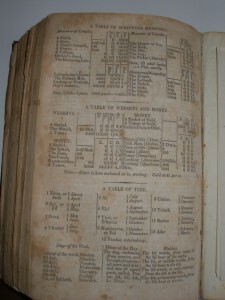 The Bible, printed in 1827, even included a Table of Scripture Measures: in dry measure, The Lethech is half of a Homer. Got that? Family Bibles can contain all sorts of information about ancestors as well as their contemporaries. I’ve read an article detailing the Lincoln autopsy printed almost thirty years afterward, and one about Mrs. M.L. Baldwin, a member of the Chippewa Tribe who was a claims adjuster in Washington, D.C. Important genealogical clues can be found in the most unexpected places: a birthday wish from my Aunt Doris to her great-grandfather Charles Otis Cony (1836–1924), for instance. 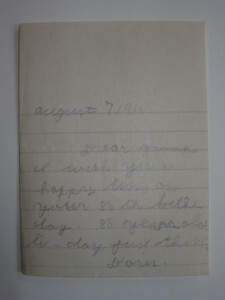 Written in her best nine-year-old hand, the darling confirmed my great-great grandfather’s birth year by dating her note and stating his age! You have treasures. I have the family Bible of my 3rd great-grandfather Charles Falvey (1803-1883) of Bureau County, Illinois. There are full dates and places for his wife, daughter, and grandchildren. He commented on the news of the day. He even included the names of the doctors who delivered his daughter and attended his wife’s death. But not one word about his own origins! What is a good way to preserve this information long- term so that others can have access? I think there may be family members who may want the two bibles I care for, but will donate them to a historical society or state library if not. (Though I do worry about either closing their doors.) I have posted bible pages and ephemera, and written descriptive narrative as posts on my blog ( plus transcriptions so search engines can find the family names) but the blog will not continue after me. 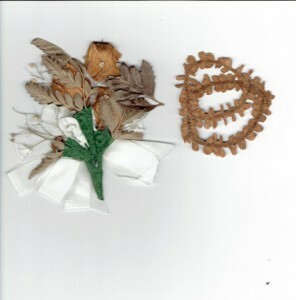 Any ideas of what to do with these treasures? My aunt sent me the family record pages of her grandfather’s (my great grand) Bible when they vacated the family home for a warmer climate. Although i am very grateful for the record pages, I still regret she did not send the complete Bible. Many don’t realize how important the title page is- if there is one. One of my family bibles has the first few pages missing, it was used so much. It is important to go page by page though, looking for the tidbits of life like those found by Jan. My family included a temperance flyer! I have several Bibles and prayer books, mostly disintegrating. How should I try to preserve them? Hi Carol – I’m not a conservator at all, but I do have a couple of suggestions. First, copy any and all of the family information these books contain. As the Bibles and prayer books disintegrate, the ink of the writing fades, making it hard to read accurately. Second, there are archival-material boxes made in various sizes to help contain and preserve books. Storing in cold, heat, or humidity can hasten the damage, so be careful where you store the books. Seeking the advice and help of a professional conservator is always the best idea! Yes Carol Copy the Tittle page and the second page. The the family pages and pictures of all the loose family letters, flowers, notices and Obituaries. Then if you can type out each page to but between each. footers should have you name, email and date. Make copies to relatives as you do your genealogy and please send a copy to Daughters of the American Revolution in National Attn:Bible Records.If you could send a copy of your genealogy as far as you have in that family. 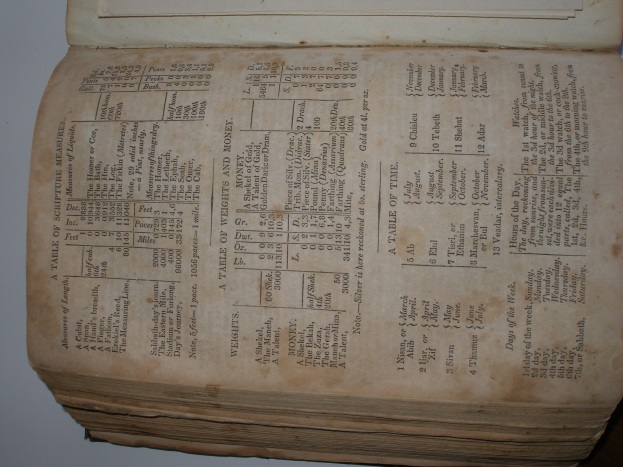 The family McKnight Bible birth, marriage and death section was copied for me by an uncle and I discovered another family Bible record in the DAR GRC index! The former contained facts I always knew but the latter, the Bible of Daniel Grinnell Lewis, contained information from an ancestor in the Mayflower Silver Books all the way to my greatgrandmother’s birth that was also in the first Bible because it was hers. These Bible records are accepted by most lineage groups as proof BUT the title pages of the Bibles were not available and both Bibles cannot be located! I have been told that the Mayflower Society will not accept Bible records without a title page. I have hunted all over the Internet for matching Bibles. The McKnight Bible is very pro temperance and obviously of the late 19th century. The Lewis Bible is much older and quite plain. How can I locate a copy of the right title page( and yes I know it would be cheating) ? And don’t forget to check the DAR GRC Index online. I learned that from an NEHGS newsletter and bingo it was a life changer to find it!